A Yellow Springs Blog: Back Story: Who let the birds out? The puppy is bored. The power has been off all night and all morning, and the humans are just sitting around doing nothing. The deck and backyard are too icy to play on, so they won't let her out. She isn't allowed to go along when the man goes out to check on the chickens. She cries by the back door. The chickens aren't aware of the power failure. Life in the coops seems normal, for winter that is. They have plenty of food and water and the sunlight shines through the window as usual. Life for the house birds too seems pretty normal. The fire in the wood stove is keeping the temperature in the living room in their comfort zone. And the sun also shines through their window. Only the humans understand their predicament. And the puppy... Well, things do seem a bit strange. But mostly, she is bored. It is lunch time when the woman opens the door to the birdcage to let them out, so the dog will have something to occupy its attention. The man is eating a salami sandwich. The birds fly over to look at the dog. They land on the back of a chair in the kitchen just a few feet away. The dog is excited. The sound of their flight spooks her at first, but, once they are settled, she is all curiosity. She lets out a high-pitched squeal that only a little heeler like her can make. 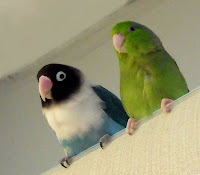 The blue lovebird mocks her sound. That gets her going even more. The woman hushes her. The green parrotlet flies onto the man's shoulder to beg a bite of his sandwich. The lovebird joins her. They are even closer to the dog, now. The puppy jumps up onto the mans leg where he sits on a stool. The birds are undaunted as they chew on crumbs of multi-grain wheat bread. The woman picks the dog up and moves her closer. It snaps at the birds. The lovebird, a male, opens his beak at her in a threatening gesture. The birds are not afraid of the dog. In fact, they seem to like the dog. It makes interesting sounds and it is fun to look at. If anything, they are jealous, because, since the dog moved in, the man doesn't pay much attention to them anymore. But the dog is a bit of excitement in their lives, just as they are in the dog's, especially on a day when there is no electricity and the humans are just sitting around, eating lunch and playing cards, all of which they don't understand. The man is done with his sandwich. The birds fly off to perch atop a darkened television. The dog watches them go. She lets out another high pitched cry. The lovebird returns her call from the other room. Far more interesting at your house then ours. The power was out for two nights so we read by flashlight. Well, that was pretty much it.